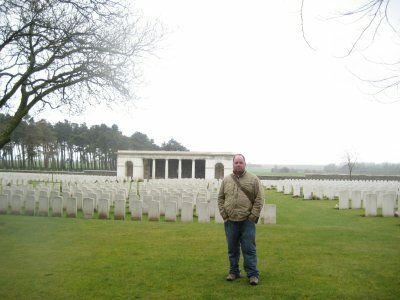 The second of three entries on my trip around the World War I battlefields of Flanders. 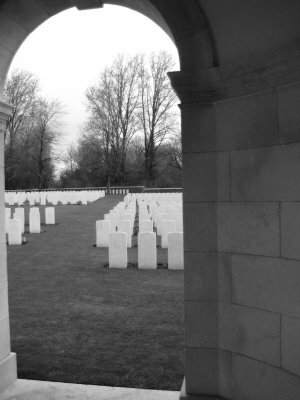 The Brooding Soldier in Flanders' Fields looks at the start of the war and the Second Battle of Ypres. 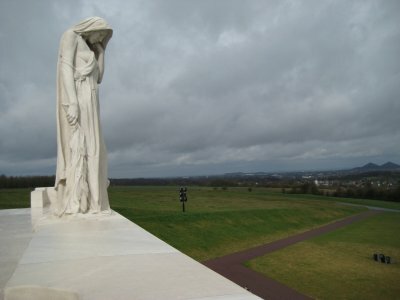 This entry entitled A Young Nation Mourns Her Dead, published on April 8th, 92 years less a day from the battle, looks at the Battle of Vimy Ridge and the Canadian National monument that stands on the battlefield today. I died in hell - They called in Passchendaele looks at the Battle of Passchendaele and the end of the war. Following on from the second battle of Ypres, trench warfare continued for the next couple of years, with much death and destruction but only small movements in the lines. By 1917, while still at a stalemate, the British and French forces were winning a war of attrition. The German forces, fighting on two fronts, had inferior numbers. The British army sought to exploit this by advantage by breaking the German lines and moving the war from the Trenches and out into the open. The Battle of Arras was a month and a half long offensive on a number of fronts. The first attacks occurred on April 9, 1917. 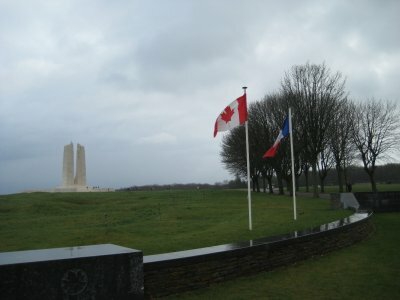 One of the fronts was at Vimy Ridge. 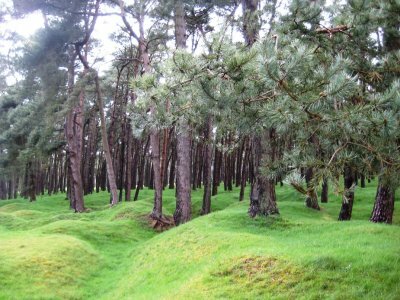 Vimy Ridge is a gradually rising escarpment on the western edge of the Douai plain, strategically important because it allows those at the top of the ridge to have unobstructed view for kilometres. The ridge had fallen under German control in October 1914 and by April of 1917 no one had been able to dislodge their hold on the ridge. The 4 Canadian divisions that made up the Canadian Corps launched an attack on 5:30 am, Easter Monday, April 9th, using a combination of artillery, air attacks as support for the infantry charge up the hill. In preparation, the soft chalk ground had been lined with tunnels to connect the front lines with the reserves and supplies in the back. Over the next four days the Canadians slowly made progress cutting into the German lines, and by nightfall on the 12th of April, the Canadians had captured the ridge. In the battle, Canada lost 3,598 men, and saw another 7,004 wounded. 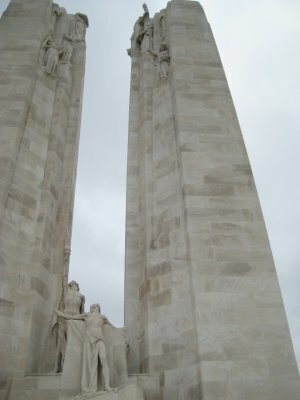 The Battle of Vimy Ridge was the first time that the four divisions of the Canadian Army fought together as a single unit, and within Canada it is viewed as one of the primary events that gave Canada its identity as a nation separate and distinct from Great Britain. 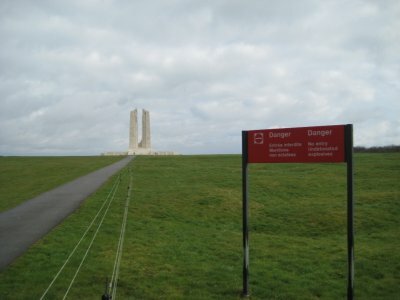 It is atop Vimy Ridge that the largest of Canada’s World War Monuments sits. 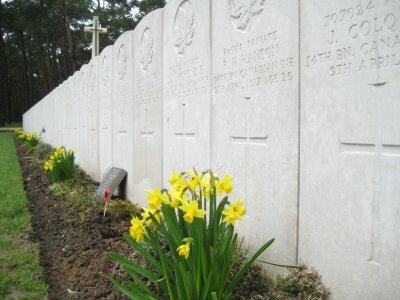 It is dedicated to all those Canadians who died during the Great War. 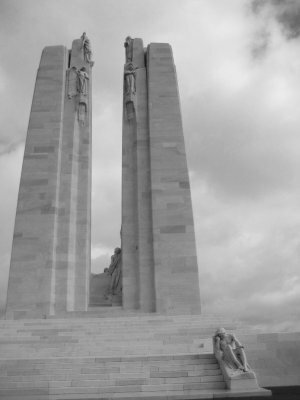 The monument is also inscribed with the names of 11,285 Canadian soldiers who were killed in France but whose bodies were never found or graves were lost. 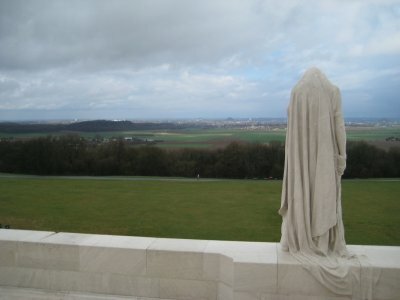 A cloaked figure stands at the front, or east side, of the monument overlooking the Douai Plain. 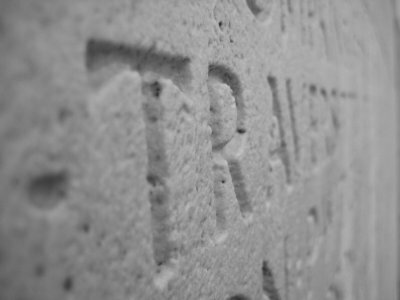 It was carved from a single, 30-tonne block and is the largest piece in the monument. 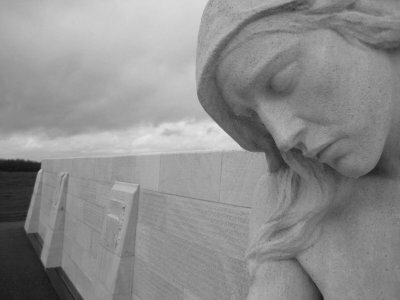 This sorrowing fi gure of a woman represents Canada—a young nation mourning her dead. 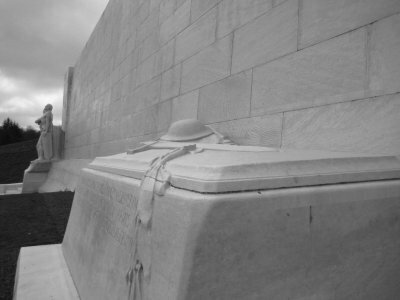 Below is a tomb, draped in laurel branches and bearing a helmet and sword. 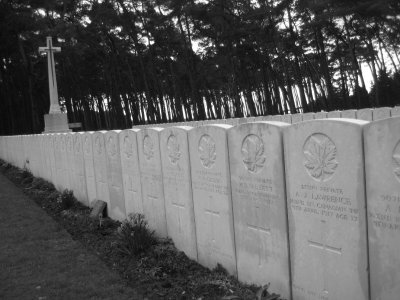 Down the road from the memorial, through the pine forest, are a few different cemeteries with Canadian dead. 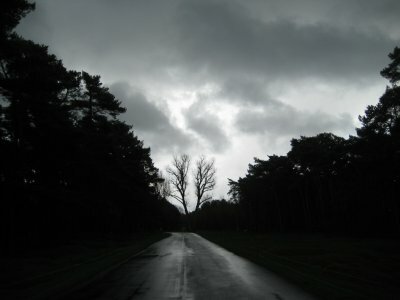 As I walked between the cemeteries, the visitors centre and the memorial itself, the weather turned time and time again, going from sunny to cloudy to raining to hailing and back again in a matter of minutes, almost like 4 years worth of weather within a few hours. As I wandered the cemetery, it was raining. I huddled up against the cold rain and tried to keep my camera dry as I took pictures, but couldn’t help but think about what these fields must have been like for a infantry man back during the war, when a full winter’s blast and hard rain would pelt them for weeks on end. When the sun was out, though, I couldn’t help but be struck by the beauty of the place, with the green ridge sloping down away from you, allowing you to view miles of beautiful French countryside, the pine forests rising up behind you. I would sometimes find myself getting lost in the beauty of the place, only to suddenly remember where I was and feel guilty for thinking nice thoughts about the scene of so much death. Through the whole trip, I found myself alternating between a number of emotions: pride in my country; grief for those fallen; shame that I have never had to go through something like that, but also relief that I grew up in a place and time mostly featuring peace; wonder at the beautiful French and Belgian countryside; and even some sorrow that I never got to know my grandfather, who also fought in the war. As I left Vimy Ridge and drove south, I saw a farmer cutting through a field that was fenced off. Like much of area around the ridge, it was closed off to human traffic due to the large amount of unexploded artillery shells and mines that still are buried in the scarred and undulating land today. In the 1990s a mine removal engineer, after successful de-arming a mine just a few weeks before, was killed in a tunnel collapse. In 2001, the entire village was evacuated after 170 tons of explosives containing mustard gas were found to be improperly stored. The farmer, though, strode casually through a field which still might have had the fire power to kill him. He obviously was familiar with the land and knew where we could walk. It was his casual attitude that reminded me of what I had seen in Bolivia after rioting and fighting had brought the city to a standstill. As the rioting died down, the people of Bolivia got back out on the streets. From ultimate horror, people just get on with life. To the farmer, this wasn’t the site of a horrific battle and proud Canadian achievement. This was a farm field, close to his own house and livestock, and the fastest path was through it. After the dreadfulness, we pick ourselves up and move on. Life continues.